How Lou Sees It: Luchador! Hi Mark! Thanks for taking the time to answer just a few questions. Hopefully they will help everyone get to know you and the game you designed better. A - I'm an expat American living in the UK for quite a long time. I'm a Learning and Development professional during the day. I'm a Mormon 24/7. I've been gaming since I was very young with my family (the usual... Monopoly, Game of Life, etc.) and was probably around 12 when I discovered war games (1862 by Parker Brothers and Battle Cry) and D & D. Late teens and I got into war gaming seriously playing Avalon Hill Games and subscribing to Strategy and Tactics Magazine so I was a gamer during the first golden age of war gaming (yes, I'm that old). I even went to the 2nd (I think) Origins Convention sponsored by Richard Dunnigan's SPI war games company. My interests expanded into Warhammer 40K and American style games. About 4 years ago I started the Boardgames in Blighty blog writing reviews and news pieces. Interestingly, I started designing war games in the late 80's but with moving to the UK, it all took a back seat. A few years ago, I collaborated with Michael Fox of the Little Metal Dog Show and designed Ace of Spies which was published by Albino Dragon and about 18 months ago, I submitted my design for Luchador to Backspindle Games. Q - Now that we know when, how did you come up with the idea and what was your inspiration? A - I blame the awesomely "Bance" guys from the Flip the Table Podcast. They simply tweeted one day that it would be great if someone would design a good wrestling game and we tweeted back and forth a bit and thought, "well why not have a go?" Q - I really don't know much about the game and I bet some of my readers are in the same boat. I just keep seeing pictures of what seems like a really fun dice game. Can you give us all a low down of your smack down successful game? A - Well, at its core, its a dice game set in the world of LUCHA LIBRE where 2 players face off, roll wrestling dice against each other at the same time (yes, you can knock each other's dice out of the ring) scoring Hits, Blocks, Counter-blocks, Pins, and Misses. Unblocked or Uncountered Hits allow players to roll their Hit Die scoring damage against their opponent. Hits range from chops and elbows to Chair and Table smashes. 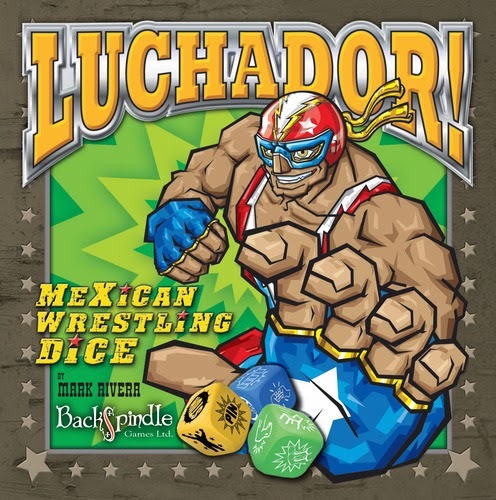 2 Hit results on their wrestling dice can be traded in to roll the special move the big chunky Luchador! die which can cause more damage but risks causing injuries. BUT, its glorious! Players that are weakened enough can be pinned by rolling the Pin die. If a Pin result is rolled, the opponent has to survive the referee's 3-count or lose the match. The game can be learned in 5 minutes and games last 10 - 15 minutes. There are rules for 4-player Tag Teams which makes it all even crazier. Luchador 1st ed is designed for the widest possible accessibility so its an easy game to learn and play. 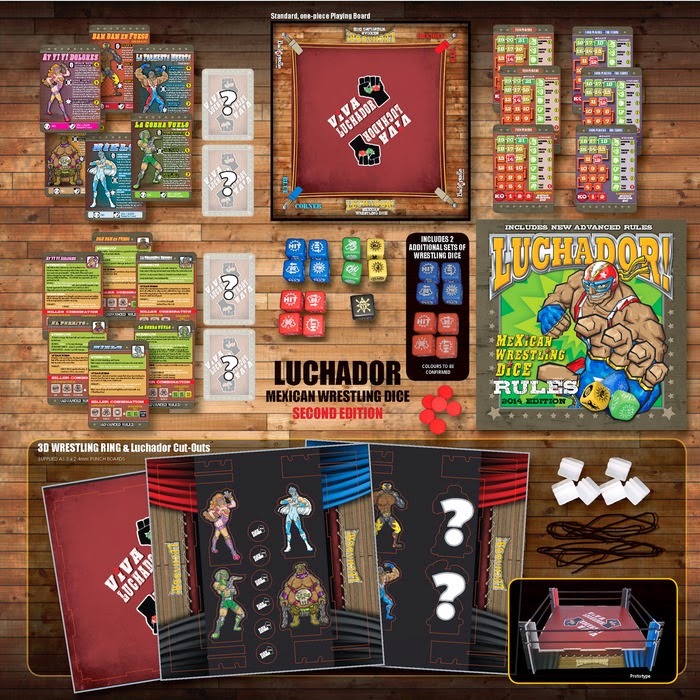 Luchador 2nd edition, now on Kickstarter, adds more complexity with individual strengths and weaknesses for the Luchadores, 2 new Luchadores, a 3-D ring, individualised Killer combos that call for more decisions, and new match types. Q - What does a typical turn or round look like? A - Typically, each player rolls their wrestling dice, only dice that stay on the board count, results are compared, results applied, hit damage is scored and Pins rolled for and applied if the targey opponent is "pinnable". Q - What is your favorite thing about the game? A - The smack talk which is hilarious and referee 3-count which is very tense and loud and has the potential for reverse Pins. Q - This was a successful Kickstarter already, why Kickstarter again for version 2.0? A - Actually, 1st edition went straight to print so Backspindle Games could deliver for Essen 2013. 2nd Ed needs Kickstarter to raise the funds to publish. Backspindle is a very small company and see Kickstarter as a great way to raise capital. Q - Who is your favorite wrestler? Q - What is your favorite board game? A - Tough call. Currently its Memoir 44. Q - Is there something more you wanted to incorporate into the game, but had to leave it out or one reason or another (maybe too pricey, or it didn't translate well into the board game medium)? Q - If you could play your game with one famous person today, who would it be and why? A - Rey Mysterio. I think he would like it. Q - One word to describe you? Q - One word to describe Luchador? Q - Anything else you would like to add? A - Luchador started out as a game for wrestling fans but it turns out all types of gamers and non-gamers love it. 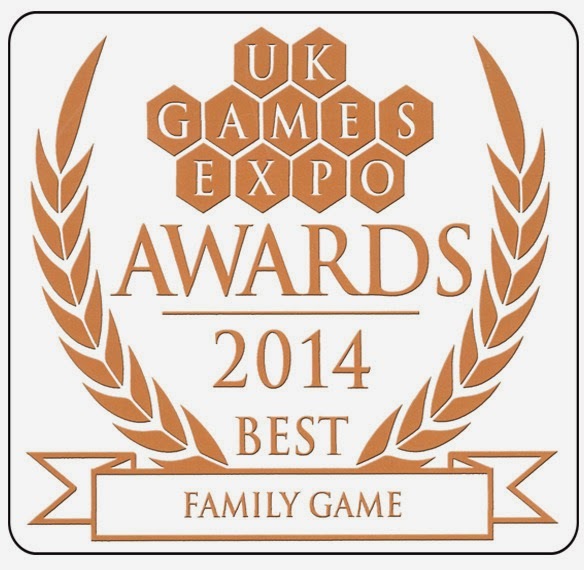 Lots of families have really enjoyed it, so winning the Best Family Game Award at UK Games Expo last weekend was especially gratifying. Please check out the Luchador! 2nd Edition Kickstarer project! Well Mark, thanks again for your time and for answering my questions! I hope that I can get my hands on a copy one day soon! Best of luck on the Kickstarter! If you are interested in learning more about Luchador! or how you can support the project, head on over to their Kickstarter page and until next time, that is How Lou Sees It! My Card Sleeves Bit Me!